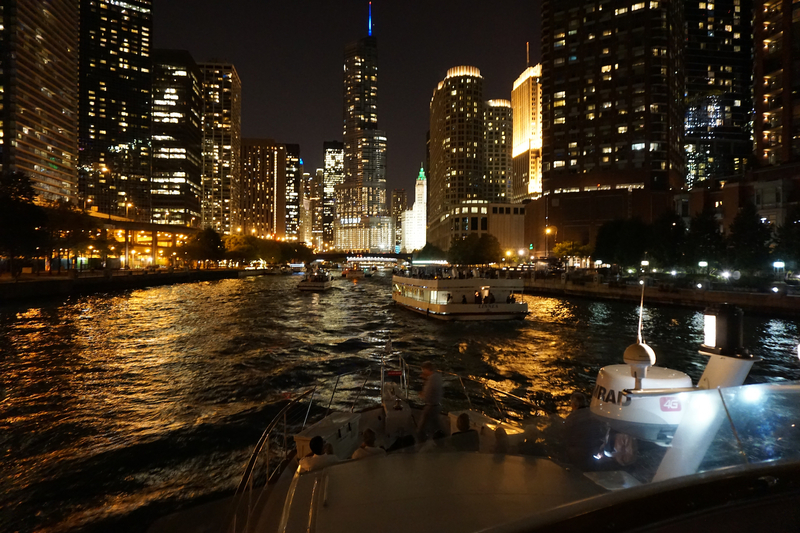 Out of all the tourist attractions in Chicago, none are more captivating than a charter down the Chicago River. This is due to the fact that this waterway was pivotal in making Chicago a key part of America’s industrial system. What started as a solution to the city’s sewage problems ended up connecting Chicago to the Gulf of Mexico. Utilizing a 156-mile long system of rivers and canals, the Chicago River was reversed and connected the Great Lakes to the Mississippi River Basin. This created access all the way to the Gulf of Mexico, which completely transformed America’s importation and exportation routes. To truly understand the magnitude of this project, going down the Chicago River in person is essential. 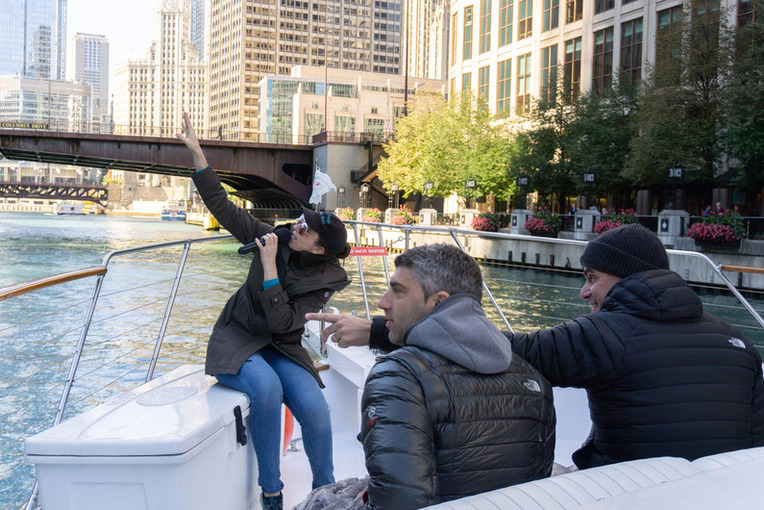 Adeline’s Sea Moose provides a luxurious alternative to overcrowded public tour boats and invites you on a private Chicago river boat tour. Instead of being packed into a confined space with strangers, our yacht takes you on a unique and exclusive Chicago river boat tour that sets the stage for a secluded celebration. 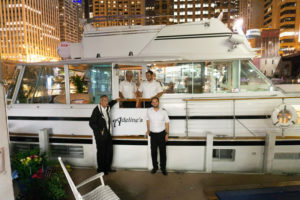 Bring your friends and family aboard one of the largest yacht in Chicago. Our impressive list of amenities is only outdone by the amazing amount of history that our docents unveil during each charter. This river has a shocking amount of secrets, so get a preview of what we go over during our tours with this list! Fact #1: Unexpected First Settlers –Despite what many Americans assume, the first European settlers on the Chicago River were the French. In 1673, Jacques Marquette and Louis Jolliet discovered the area and reported their findings. This led to multiple French colonies occupying the area. Unfortunately for these new settlers, they were not welcome. From 1712 to 1733, constant brutal attacks from the Fox Indians forced the French to abandon the area. While the Fox Wars were deadly for the French, they unintentionally paved the way for American colonization. In 1795, an Indian confederation granted treaty rights to the United States at the mouth of the Chicago River. The Treaty of Greenville was followed by the 1816 Treaty of St. Louis and the Treaty of Chicago. These agreements gave Americans more access to the land that lined the river. On top of being essential for expansion, getting access to this waterway helped birth the city of Chicago. Fact #2: Only Reversed River in the World –On top of revolutionizing American trade, the Chicago River is a feat of modern engineering. It’s the only river in the world that was made to flow in the opposite direction of its natural path. Aside from defying nature, this groundbreaking solution to Chicago’s early sewage problems showcases the city’s innovation. Fact #3: Unexpected Origins of St. Patrick’s Day Dyeing –Every year, over 400,000 spectators congregate along the Chicago River as it’s dyed green for St. Patrick’s Day. Even though everyone celebrates this tradition, few know why Chicago started dying the river. Unbeknownst to most, this beloved holiday bash was created by a horrific sewage problem. When Richard J. Daley became mayor of Chicago in 1955, the Chicago River was extremely contaminated. The river’s sewage problem had reached the point where it was hindering the livelihood of neighboring residents. Desperate to see who was behind the crisis, Daley authorized the pouring of fluorescein dye into the river to trace sewage leaks. On top of identifying the culprits, this dye inspired one of the most innovative St. Patrick’s Day celebrations in the world. When the city’s St. Patrick’s Day parade chairman saw the unintended color transformations created by the dye, he petitioned to dye the entire river green. This led to the Chicago Journeymen Plumbers Local dumping 100 pounds of fluorescein dye into the river in 1962. Unfortunately, this was way too much and the river staid green for over a week. Through trial and error, they narrowed it down to 25 pounds and started using a secret mixture of vegetable dye. These adjustments limited the impact on the environment, and now the river only stays green for about 5 hours. Each year the mysterious orange-colored dye powder is sifted into the Chicago river by six Plumbers Union members on two boats. Even though this tradition has routinely generated controversy, there’s no denying its novelty. Fact #4: French Inspired Name – The Chicago River’s name stems from the 17thcentury French word “Chicagoua”, which was an interpretation of a Native American term for ramps (Allium tricoccum). This North American species of wild onions used to grow along the banks of the river. While this plant has been largely removed, it’s impact on the river’s name still echoes throughout modern vocabulary. On top of featuring breathtaking views of the city, the Chicago River is an extraordinary feat of human ingenuity. Its history is just as rich as the city that surrounds it. In this article we only touched on some of the main points of what makes this river special. During Chicago River charters our talented docents go over an impressive amount of jaw-dropping facts. There’s too much history to list in this article, so book a charter with us to dive into all the details of this unbelievably important river!